Hello Everyone! Hope you guys had a wonderful weekend. Mine was great. Helped my friend moved and then spent the rest of my weekend in New Jersey. I was in Jersey spending time with my new adorable nephew. I actually made this iro (top) and buba (wrap skirt or wrapper) and wore it a few months ago (See Here). 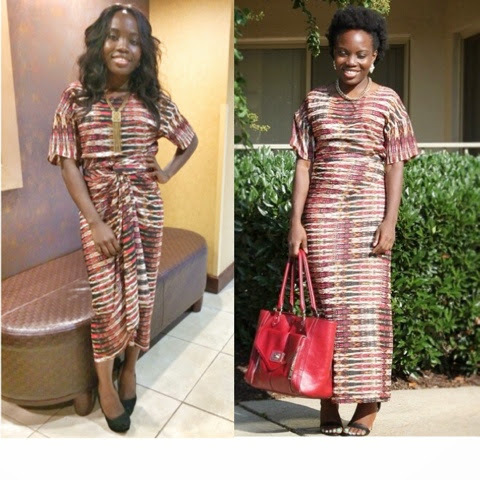 The first time I wore it (left pic), I tied the iro "wrap skirt" into a tulip style skirt. It was kind of a funky and sassy look. It was a new twist to a traditional look. I wore the outfit again the 2nd time (right pic), and decided to change up the way I tied the iro to make the look more traditional. I loved both look but my favorite is the 2nd look. It was more classy and gives a cleaner look. Which look is your favorite? For My DiY Fashionistas; Here's how I made it. Buba "Top": Vogue Pattern 8984; I'm hoping to do a tutorial on how to make it without a pattern soon. Hopefully in the next couple of months. Iro "Wrap Skirt": I cut 2 yards of fabric. Hemmed the Cut-Ends so that it won't fray. And added ties at both ends (used as a belt to secure the iro after it's wrapped around you). I think my favorite is the modern take, the first photo -- most likely because it's a fresh twist on a traditional look. (At least, traditional to us!) But it wouldn't work in a church setting, so it's nice to be able to wear these pieces the expected way, too.